Dr. Norleena Gullett of UT Erlanger Oncology talks about advantages of partial breast irradiation. Erlanger’s new SAVI ® partial breast radiation therapy offers many benefits for women with early-stage breast cancer. This unique breast-conserving therapy directs radiation only where the cancer is most likely to recur, allowing you to complete treatment in as little as 5 days and with fewer side effects. 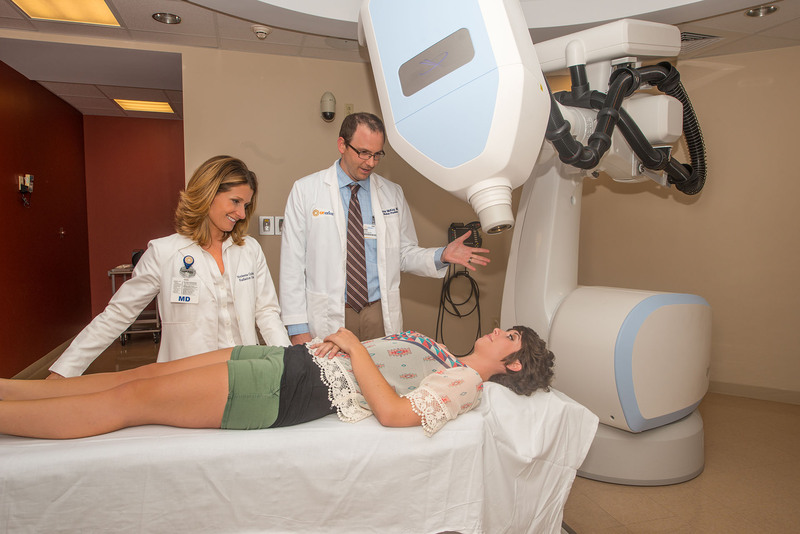 Partial Breast Radiation Therapy starts with surgical removal of just the tumor itself, while conserving the breast. Erlanger surgeons are certified in minimal-access breast surgery to help ensure better aesthetic outcomes for lumpectomy procedures. After surgery to remove the tumor, Erlanger’s oncology team reviews your final pathology (how the cancer cells look under the microscope). This includes confirming your lymph nodes are negative for cancer. We’ll also make sure the tumor is less than three centimeters in size and that the “margins are clear,” meaning no tumor cells were seen on the edge of the resected tumor. On a Friday morning, your physician will place a small SAVI® applicator (a type of catheter), in the surgical cavity of your breast using local anesthesia. Ultrasound will verify the applicator is correctly placed in the cavity. The physician will then expand the catheter’s flexible side struts, which makes the device fill the cavity. After catheter placement on Friday, you’ll come to Erlanger’s Radiation Oncology department to undergo a CT scan, called a “CT simulation.” Once the scan is done, you’ll meet with a nurse to review how to care for the device during treatment. We then encourage each patient to rest at home for the weekend while your oncologist gets to work planning the radiation treatment. The catheter will stay place in for one week. It is flexible and curves around to the side of the breast for comfort. We recommend using a sports bra that fastens in the front during treatment. On Monday, we’ll repeat the CT scan to confirm the catheter has not moved over the weekend. Your physician will connect the catheter struts to a machine that stores radioactive seeds. These seeds then come into the catheter and deliver the radiation dose right to the surgical cavity. This technique avoids radiation exposure to the skin as well as the underlying heart and lung. You essentially receive no radiation to the remainder of the normal breast or underlying organs, decreasing your risk of radiation toxicity to the heart and lungs in the long term. The radiation treatment is painless and lasts about 3-5 minutes. Once the treatment is completed, we will disconnect the catheter struts. A nurse will bandage the catheter and you will return in the afternoon for your next treatment. Treatment is done twice daily for a total of 10 treatments over the course of five days – Monday through Friday, morning and afternoon. After the 10th treatment, your radiation oncologist collapses the device, removes it from the surgical cavity and seals the wound. You’ll likely return to work the following Monday. Partial breast irradiation with the SAVI catheter allows women in our community get back to normal life as soon as possible. For more information, contact Erlanger Radiation Therapy at 423-490-9080. Watch Brenda Payne describe her experience from diagnosis through treatment with SAVI by Dr. Gullett. Learn more about Partial Breast Radiation at www.savisisters.com.